Working in tech in a major city such as London or New York City can be challenging. Rent is at a premium and the ability to save your earnings can be difficult. We’ve certainly been there and know this grind all too well. With such a high demand for tech professionals in Bangkok, cost of living and salary expectations are extremely relevant for many considering the expat life here in Thailand. Tech in Paradise founders are both from London, and have a first hand experience with making a transition to living and working in Bangkok. 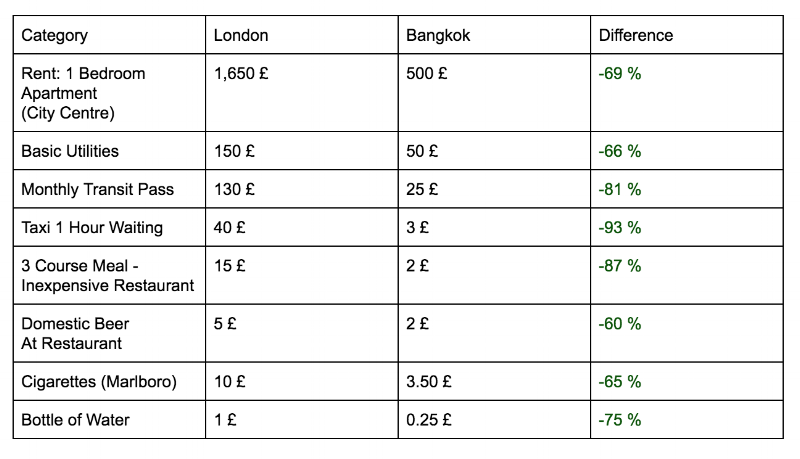 For this reason we have compared London vs. Bangkok’s cost of living below* to demonstrate how big of a difference a move to Bangkok could mean for your savings. *Numbeo was used to collect data to generate a comparison, and results are estimations only. Data is from August 2018. So cost of living is lower, but so are salaries for tech professionals right? Salaries will be quite competitive in relation to your current role. However you will likely not receive a large bump either. The main benefits of making a move are usually realized through an advancement in level of seniority. Tech professionals with experience outside of Asia are in short supply, and companies are ready to get your sponsorship started. Taking the opportunity to live and work in Bangkok could certainly propel your career forward, and allow you to SAVE MORE MONEY.